Let your walls bloom with our beautiful Flower stencils and Leaf Stencil designs! Large floral designs are becoming very popular in today's wall decorating, and with our flower stencils it's so easy to be on trend. Large flower stencil creates a stunning accent on a wall above the sofa or bed, and you can even make your own repeat stencil pattern by simply overlapping the flowers and varying your colors. Choose from popular Dandelion stencil, Rose stencil, Zinnia stencil, Lotus stencil and more! You can create soft watercolor effects by stenciling flowers with a dense foam roller or stencil brush. Large floral designs look great on painted floors too. 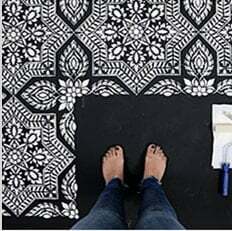 Try flower stencils instead of expensive floral wallpaper and save big on your next room makeover. Flower designs work perfectly in a little girls nursery, or for teenager's bedroom decor. Learn How To Stencil from our videos and get inspired by browsing our Stencil Blog!